To add a server, enter the host name or IP address of your server in the text box at the bottom of the window. Click on the green “+” button to add the server. 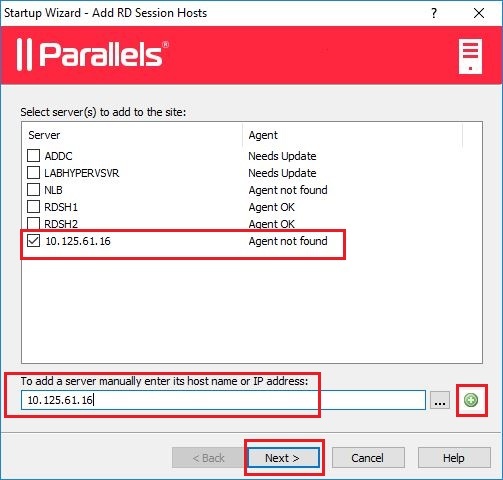 You can see multiple servers discovered by the Parallels RAS Console in different states. You will be adding a server using the IP address. Click “Next >” to continue the process. 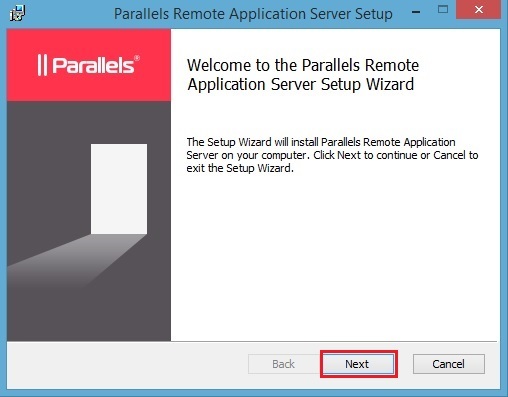 The following options are checked by default to automatically configure Parallels RAS for use on your RAS Farm without the need of any manual Windows settings. 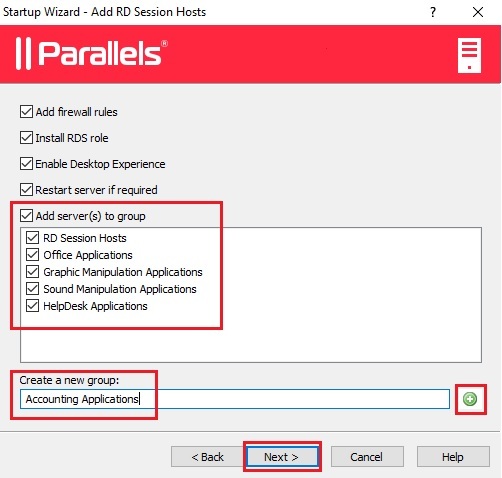 Add firewall rules – By enabling this option, you are allowing Parallels RAS to automatically add the required firewall rules for the RD Session Host application to operate smoothly. 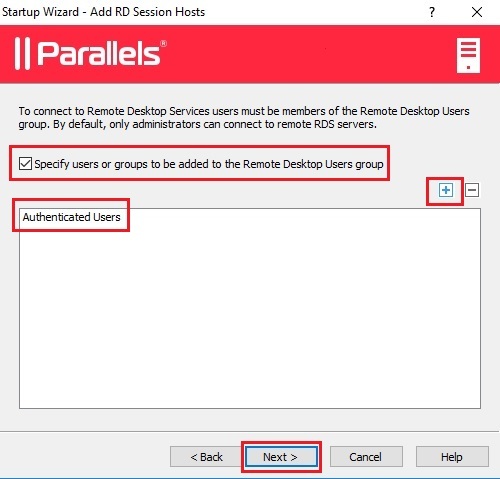 Install RDS role – This option automatically installs the Remote Desktop Services Role on the server that you are adding on the RAS Farm. Enable Desktop Experience – This is a Windows Server edition option that lets you configure your desktop to change the icons, background, and more. 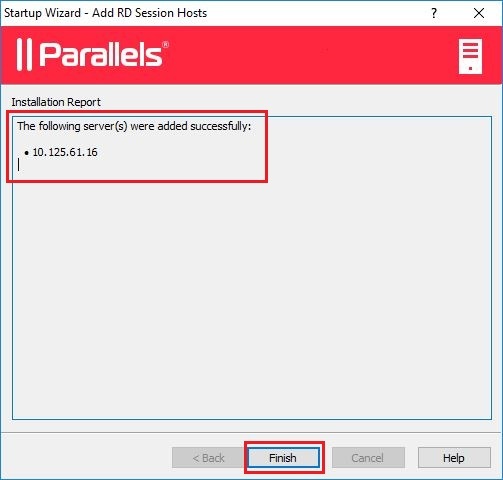 Restart server if required – This enables Parallels RAS to restart the added server if necessary after the installation is complete. Add server(s) to group – You can create and add servers to a server group. 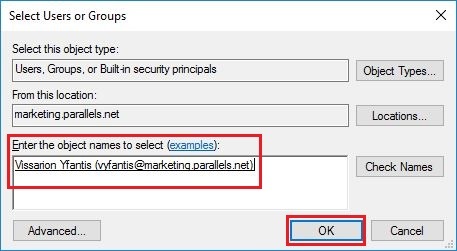 You must enable this option and tick the server groups you want to add the server to. You can also add new groups by entering the group name in the text box at the bottom of the window and then pressing on the green “+” button. This is especially useful if you want to separate the server for specific applications, like the examples given below. Click “Next >” to proceed with the RD Session Host addition. The next step is to specify the users that will be able to connect to our new RD Session Host. 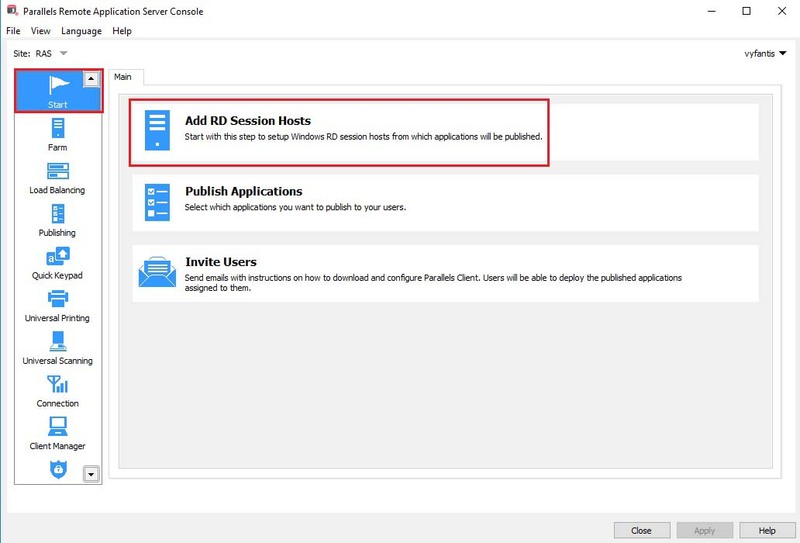 By default, only authenticated users can log in, meaning that only administrators can connect and configure the RD Session Host. You can also add a user by pressing “+” and add a user that exists in your RAS Farm. The next window displays a summary of all the configurations set up until now during the addition of the RD Session Host. You can always go back to change any of the configurations made by clicking on the “< Back” button and changing the settings. Add the server by clicking “Next >” to start the server addition. The installation of Parallels RAS services will start. After it is finished, you have to click “Done” and “Finish” on the last window of the RD Session Host addition. 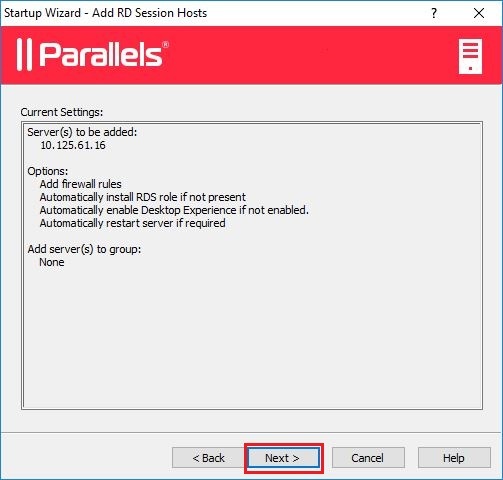 Now that you have successfully installed a RD Session Host, the next step is to add a RAS Publishing Agent to Parallels RAS, which allows you to share applications and desktops over your RAS Farm. To add a RAS Publishing Agent, click on the Farm category on the left side of the application. Under the required site, click Publishing Agents, then click on the “+” sign marked in red on the image below. 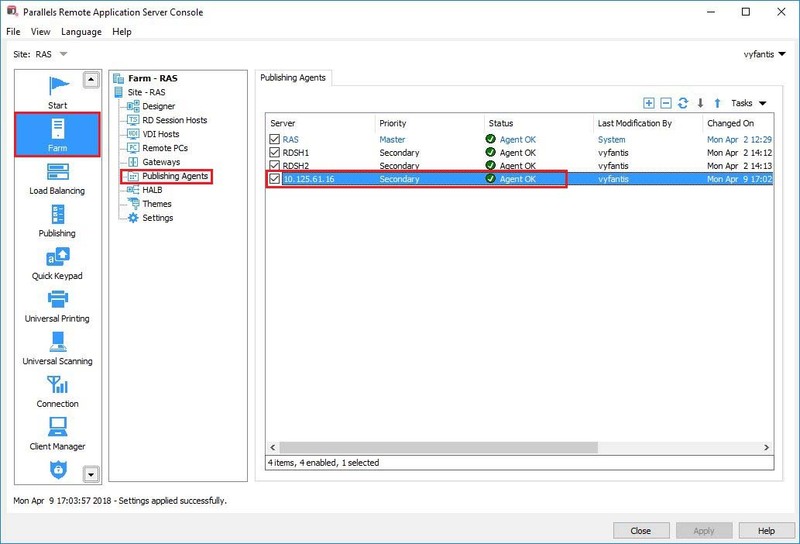 Add the server host name or IP address in the server text box and click on the “Resolve” button to verify the server’s IP address. Click “Next” to continue with the RAS Publishing Agent installation. 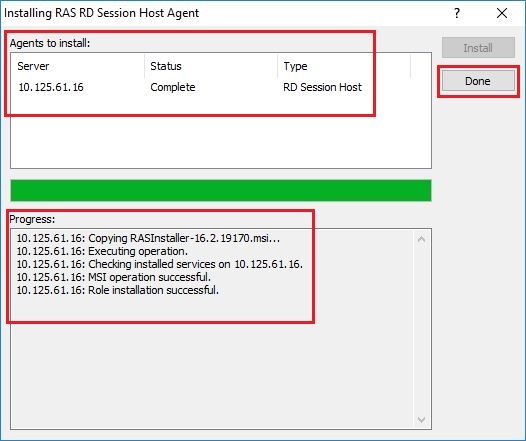 If RAS Publishing Agent is not installed on the server, click “Install…” to automatically install it. 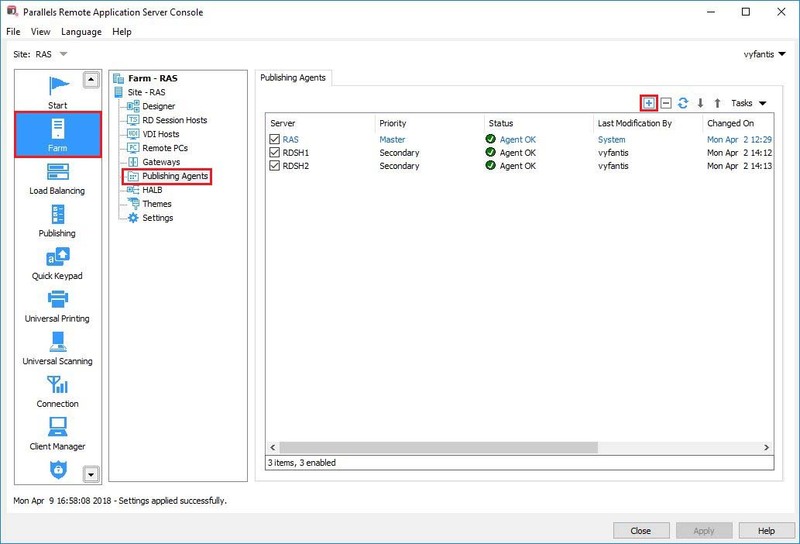 If the RAS Publishing Agent is already installed on the server, skip this step. 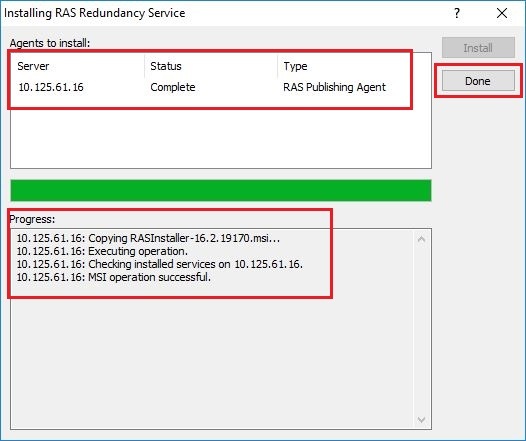 The screenshot below shows Parallels RAS installing the RAS Publishing Agent on the server. Please note that the RAS Gateway is also added with the RAS Publishing Agent. Once the RAS Publishing Agent has been successfully installed on the server, click “Done” to continue. Now that the RAS Publishing Agent has been installed and verified on the server, click “OK” to finish the installation process. As you can see in the screenshot above, the new server “10.125.61.16” has been added to the list of RAS Publishing Agents. Remember to click “Apply” to make the changes.